Constant analyzing and tracking your website’s development are one of the most significant parts of every website optimization. In most cases, different content management systems including WordPress provide their own analytic services, but search engine tools can give you much more detailed data. In this article, we’ll talk about how to register in Google Analytics and Google Search Console and how to connect them to your website using Google Tag Manager. Open Google Search Console and choose a personal account (Gmail / Google+) that must be connected to GSC account. Enter your website’s address to connect it to a console (it is necessary to specify website’s protocol – HTTP or HTTPS). In an opened window go to ‘Alternate methods’ tab and select ‘HTML tag’. After selection of a method, console will provide you a unique meta tag to verify your ownership of the website. Don’t close this tab. You’ll need it again later. Open Google Analyitcs and click ‘Sign in’ button. Check if you’ve chosen correct personal account (personal gmail.com or Google+ profile) before starting the procedure. Set up a property type (‘Website’), choose the name for your account and enter a website URL. Keep in mind to choose an appropriate website protocol. In the case if you still use HTTP, we highly recommend to use our guide for secure connection setting and only then start GA registration procedure. This will help you avoid many problems in future. After saving your registration information, the system will generate unique ID and specific code for implementing into your website source code. To integrate website with web analytics we’ll use Google Tag Manager, so it is enough to use ID only. Leave Google Analytics settings panel and open a new tab in your browser. 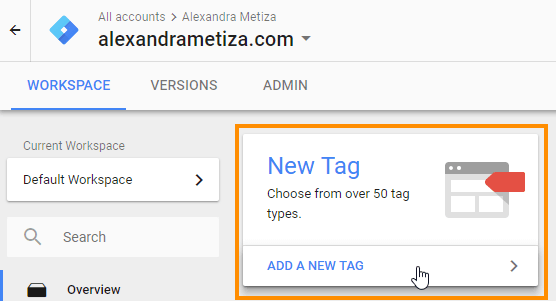 Google Tag Manager is a unique ‘organizer’ for tracking code managing. It allows connecting different analytic systems from search engines and advertising platforms with one piece of code instead of tens. 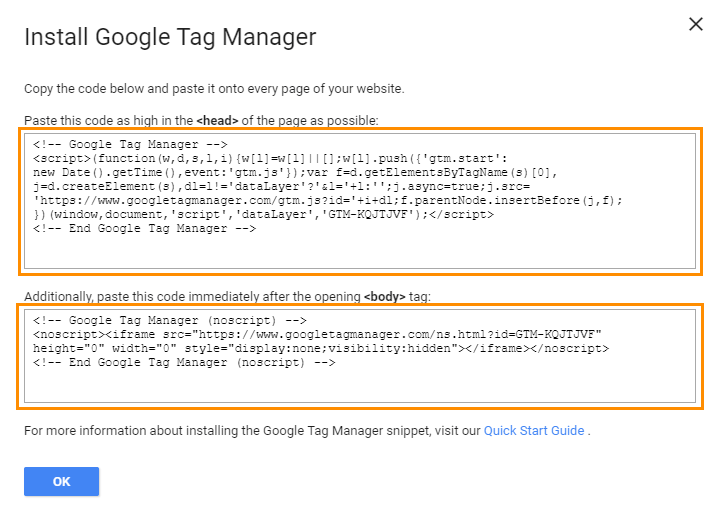 Later you can change Google Tag Manager code without web developer’s help. Open Google Tag Manager and login with your personal Gmail account. Click ‘Sign in’ button. Name your account. Go to ‘Setup Container’. Choose where to use container (‘Web’) and enter your website address. Click ‘Create’ button. After saving your registration data, you will receive unique GTM code consisting of two parts. You’ll need it a bit later. Click on a ‘New tag’ card on a ‘Workspace’ tab in your GTM account. In an opened window click ‘Tag configuration’ and choose ‘Universal Analytics’. Save changes. GTM will ask you to add a trigger. Click on ‘Add trigger’ button. Select ‘All Pages’. Finish editing and save a tag. In your Google Tag Manager account open ‘Tags’ tab. You’ll see there the tag for GA you’ve made before. To create GTM tag for implementing in your website, click ‘Submit’ button and then ‘Publish’ button. Click on a link with personal ID on the dashboard to get a code for your website. Open a new tab in a browser, but don’t close the current tab. 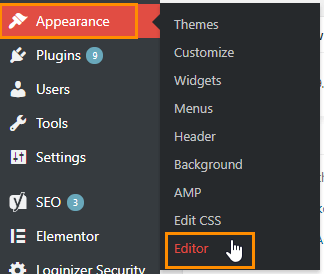 Open your website console and go to ‘Editor’ in the ‘Appearance’ menu. 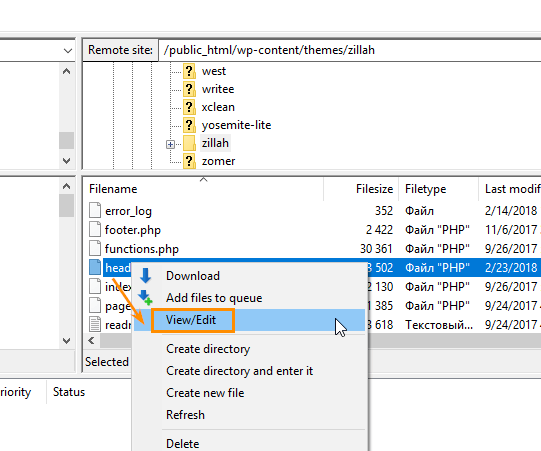 In the list of theme files find Header or Theme Header (header.php). Click on a file name to open it. Find opening <head> tag and put the first piece of GTM code and Google Search Console meta tag below it. Place each element in a new line. Find opening <body> tag and put the second part of GTM code below. Save changes and close the editor. If you didn’t work with Filezilla before, open the ‘File’ menu → ‘Site manager’. In an opened window click a ‘New site’ button and enter registration information from your hosting provider. In the folder /public_html/wp-content/themes/name-of-your-template find header.php file. Right-click on it. Choose the ‘View/Edit’ command from the context menu. In the opened file perform actions described above. Save changes and overwrite a file. Keep in mind that in case of template change you need to repeat this procedure and implement all codes and meta tags again, but in the header of your new website template. After procedure completion you need to open a tab with Google Search Console and click ‘Confirm’ button. If everything was done properly, you’ll see corresponding notification. Then system will redirect you to the setting page. 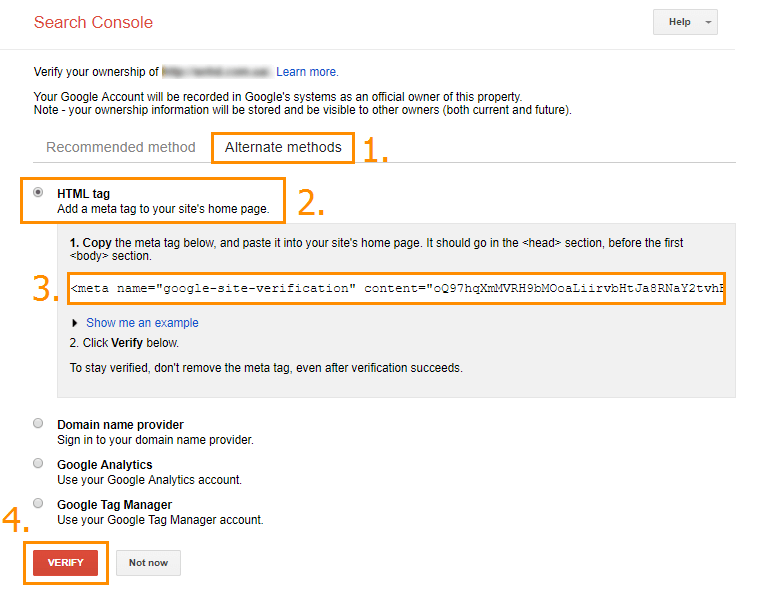 To make sure that GTM code was implemented correctly, go to your Google Analytics account. In the ‘Reports’ tab choose ‘Real-Time reports’ → ‘Overview’. Pay attention to the quantity of active users. If you are currently visiting your website and tracking is not blocked by some browser widgets (for example, Ghostery), this indicator will show one user. After completing the final check, we recommend to make all your website team install and activate Ghostery browser widget to exclude your visits from analytic reports. Analytic systems and webmaster services provided by search engines are basic tools for every web developer, SEO specialist, and website owner. They help you get a complete picture of search engines’ perception of your website. Register in Google Search Console, Google Analytics and Google Tag Manager. 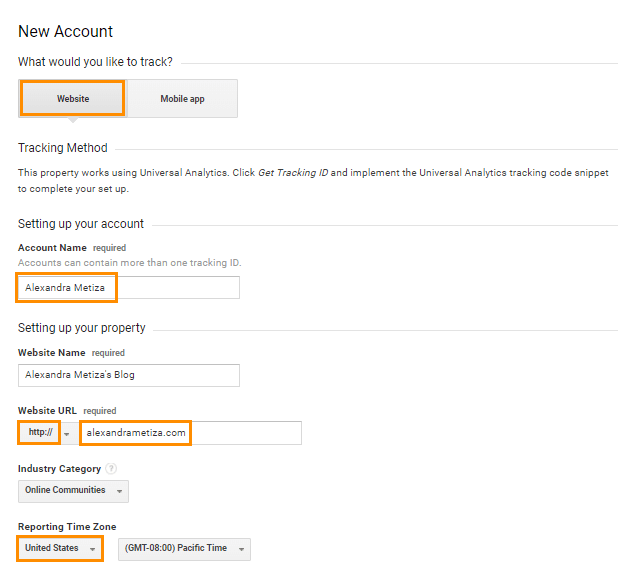 Connect your Google Analytics account with Google Tag Manager. Implement GTM code and Google Search Console meta tag in your current template’s header.php file. Check if everything was done properly. If you still have some questions or comments, please leave them under this post and we’ll be glad to answer them! By the way, the next post in this series will be dedicated to WordPress websites markup. We’ll talk about its different types and implementing. Stay tuned!